always to offer quality equipment at low prices with expert advice from trained experienced staff. We stock many mobility aids and products to help make life easier for you and help everyone live more independently and safely. With a wide range of beds and made to measure riser/recliner chairs with many options including built in pressure care. One trusted and proven powered solution to get you in and out of bed safely and help to maintain independence at home for longer are Theraposture’s Rotoflex beds and one is always available to try out at our Enfield showroom. The Rotoflex is an electrically operated adjustable bed that also provides powered rotational assistance to get you in and out independently. It helps anyone with progressive neurological conditions such as Parkinsons and MS. This rotating bed is the original and proven rotating bed system. Uniquely, this sophisticated adjustable bed has been developed over a period of 20 years. It allows people living with restricted mobility to access a bed independently and safely without the assistance of a carer. This bed can reduce the high and ongoing cost of care. If bed transfers involve two carers, typically this will cost £27,500 each year. The Rotoflex costs £8695.00 meaning that it pays for itself in just 16 weeks and if it reduces the assistance needed from two to just one carer, it pays for itself in 32 weeks. after that it is saving you money! 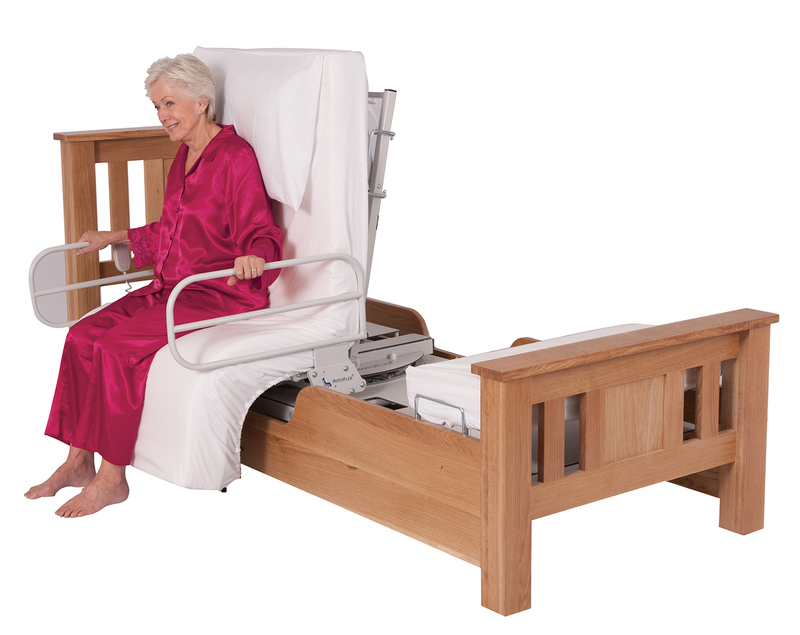 Theraposture offers the widest choice in rotating beds so that a variety of individual needs can be met. As either a single bed or part of a double bed (dual combination), every Rotoflex is available in a variety of surrounds that will aesthetically suit your home. There are also low access Rotoflex beds and options for heavier users weighing up to 39 stones. Ergonomic seat dimensions may become even more important to you as your condition progresses. The Rotoflex has a seat depth and height that mirrors that of a typical person. For shorter users, we have a low access version that was added to the range in 2016. This is the ONLY low access rotating bed available! to book an assessment appointment with our Rotoflex bed at our Enfield showroom and one of our qualified Trusted Assessors will guide you through all the bed can do and the options available. The bed can also be made as a double combination so partners can also then decide whether to have any profiling or variable height functionality on their side of the bed. The Rotoflex and any profiling bed can be made to look at home in your own home. Theraposture beds can be finished in solid oak or upholstered in fabric if preferred. Following purchase, peace of mind is assured through Theraposture’s 14-day Suitability Guarantee which provides time to assess suitability without the worry of being left with a bed that isn’t suitable for you.